Vice President Yemi Osinbajo has urged All Progressives Congress (APC) members not to relax or take anything for granted ahead of the March 23 governorship election rerun in some states. Osinbajo communicated this while addressing party faithful at the PMB/PYO Volunteers Appreciation Dinner at the State House Banquet Hall on Thursday in Abuja. He thanked the volunteers for their commitment and trust, saying that with the re-election of President Muhammadu Buhari, Nigeria was on course for greatest. “ believe that with your support our country will continue to move forward; everything we want for our country will be done, and by the grace of God, every one of the President’s projects will be done. `Our economy will turn around and we will see prosperity in this great nation. “Let me just say that we are still not done with elections. “On March 23, we still have some outstanding states; as you know, there are rerun elections in about six states. “ And we still need to put efforts in those six states. We cannot afford to slack up and say the job is done; we still have some things to be done,’’ he said. 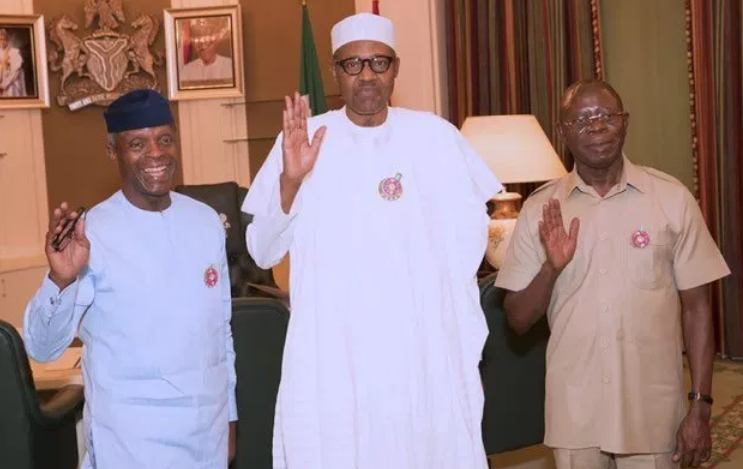 Osinbajo expressed APC’s condolences to the families of those who lost their lives during the process, and asked for a minute silence in their honour. He said that the campaign was about the Nigerian people whom he said were very trusting and supportive of their leaders without asking for much. The vice president said that the Buhari-led government had achieved much in four years in spite of earning less—a feat which was achieved because of Mr President’s honesty and integrity. Mr Ade Ipaye, Deputy Chief of Staff to the President, said that Nigerians had demonstrated their confidence in the ability of Buhari and Osinbajo to pilot the nation. He said that Nigerians not only voted but made sure that their votes counted. Ipaye commended the President and vice president over their energetic campaign that saw them going round the country. The deputy chief of staff also thanked God for securing the President, vice president and the campaign team throughout the campaign. Retired Brig-Gen. Buba Marwa, Director, Women and Youths, APC Campaign Team, expressed appreciation to Osinbajo for arranging a platform to thank the volunteers. He thanked God for protecting the vice president in the helicopter crash as he and the crew all came out unscathed. Marwa said that Osinbajo exhibited uncommon commitment and courage by proceeding with his schedule shortly after the crash. “Something told me we will be victorious after the vice president survived the crash. “Why else should the vice president survive if not that God has prepared him for another four years. “He continued with his campaign immediately after the crash; he deserves applause. “We thank God for the president who was able to visit all the states; he went to each and every state. There were also goodwill messages from some other party functionaries. The gathering was thrilled by a cultural troupe and comedy rendition.